By Sunday morning those of us in Bamako had all heard the news that broke late Saturday night: after weeks of deadlock, negotiators from the Economic Community of West African States (ECOWAS) had reached an agreement with Mali’s CNRDRE junta, and interim president Dioncounda Traoré would remain president during the transition. The junta’s leader Captain Amadou Sanogo himself appeared briefly on ORTM television to announce that he would abide by the agreement. Facing renewed international sanctions, the junta appears to have backed down from its insistence on holding a national convention to choose Mali’s next head of state, and the state newspaper L’Essor today trumpets that the country’s institutional crisis is over. Most of us have learned to be circumspect, however, especially where Captain Sanogo is concerned. As he pointed out, the agreement announced late Saturday is only an agreement “in principle,” and many details remained unresolved. Some of these “accompanying measures” have surfaced in the last 36 hours: according to the AFP, Captain Sanogo will be granted the status of a former head of state, which we understand means a hefty salary (roughly 50 times his current army pay) and a nice home at government expense, among other perks. Dioncounda’s term in office will be set at 12 months. It is not yet clear what exactly his powers will be, however, and what role the CNRDRE may continue to play. We are still waiting to hear what Captain Sanogo says about the deal if and when he addresses the nation in the Bamanan language, when he is likely to put a different spin on things than he does in French. Even if Sanogo won’t be president of the transition, nobody in Bamako thinks we’ve seen the last of this man. ORTM coverage of the deal has been muted, to the point that many of us wonder how much editorial control the junta retains in the newsroom there. The 1 p.m. news edition on Sunday didn’t even mention it until the end of the broadcast, as an afterthought. The 8 p.m. edition led with the story, and much was made of the fact that Dioncounda appeared wearing a grand boubou of white damask, making him look more presidential than his usual rumpled suits. This story, however, was followed immediately by an item about a parallel initiative by a pro-putsch political front (la Coordination des Organisations Patriotiques du Mali, or COPAM) to forge ahead with a national convention anyway, contesting Dioncounda’s extended term in office and reopening the whole debate that had seemed closed for at least a few hours this weekend. Never mind that Captain Sanogo himself has continually referred to a vague plan to let “the people” decide. Never mind that Dioncounda, as the most recent speaker of Mali’s National Assembly, has constitutional legitimacy as transitional president, or that his powers will be limited at best. 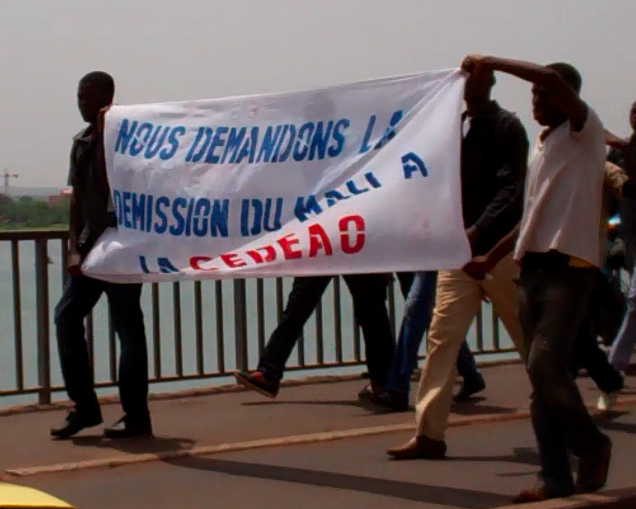 Never mind that Mali is a member of ECOWAS and has unfailingly supported its decisions concerning other member states. In the “what could go wrong next” department, we can consider a couple possible scenarios. One, the rank-and-file troops who mounted the March coup and have backed Sanogo ever since could accuse him of cutting a sweetheart deal and selling them out. They could reject the new accord and refuse to recognize Dioncounda’s authority. Two, COPAM’s two-day “national convention” — which was hastily called on Sunday and began this morning at the Centre International de Conférence de Bamako, or CICB– could divide Mali’s political class and seriously weaken Dioncounda’s power. I’m starting to wonder how relevant Captain Sanogo’s intentions are in this affair. As one Malian journalist commented today, “It’s not enough for ECOWAS to want something, and for Captain Sanogo to come out in favor of it, for us to rest easy. Because in truth, neither the captain nor ECOWAS have convinced Malians.” If they don’t do a better job of convincing Bamakois to make this deal stick, it looks like we are in for more trouble ahead. Update, 1700 GMT: I’d heard rumors about this throughout the afternoon, now confirmed by the BBC — Dioncounda Traore was attacked and knocked unconscious by protestors earlier today. Such is the antipathy in certain segments of society toward Dioncounda that there are apparently few members of the security forces willing to take a punch for him. Never mind a bullet. Still, the fact than an elderly man (Dioncounda is 70) can get roughed up by young thugs is a chilling sign that longstanding social taboos in Mali have fallen by the wayside. Recent media reports make it clear that the second scenario outlined above is moving right along. This entry was posted in Uncategorized and tagged bamako, cnrdre, coup, mali, politics. Bookmark the permalink. 13 Responses to A deal, but will it stick? Needless to say, this is all so unbelievably tragic… Who would have imagined on 3/22 when the coup happened that Mali’s north and south would be in such utter chaos two months later??? It’s as if every worse-case-scenario prediction has come to pass. 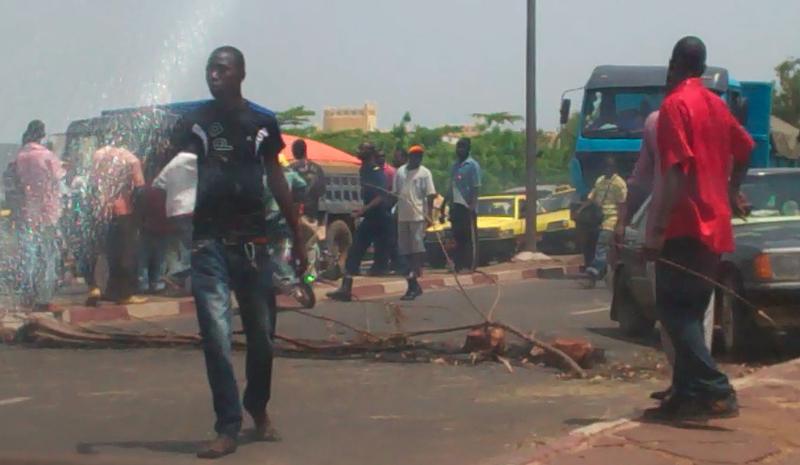 Bruce–do you have the impression that things are calm in other cities, like Sikasso and Segou? Sad to say, the only news I get these days from Segou & Sikasso has been ORTM coverage of pro-junta rallies there. Such items appear every several days on the TV news. Wow. An Islamist rebellion controlling a significant portion of the territory, an illegitimate government riven by corruption, a military of dubious competence and questionable loyalty, a disillusioned and uneducated populace who react emotionally rather than rationally to any sort of agitation….thank God I’m here in Afghanistan where we don’t need to worry about such things! Perhaps you missed my post from a couple weeks ago, “Afghanistan-on-the-Niger“? K’an kelen kelen wuli, Bruce.